Description: Upland boreal forests occupy most of the RNA. 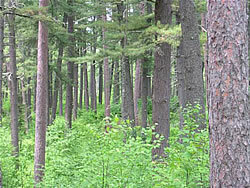 The distinguishing feature is the old-growth eatern white pine (Pinus strobus) and red pine (Pinus resinosa); one of the few remaining, largely unmodified tracts of high quality virgin pine in the Lake States. Nearest weather station, with distance and direction from RNA : Winton Power Plant is located 24 miles (38.4 km) south-southeast of the RNA. Annual precipitation (type, seasonal distribution) : Average annual precipitation is 27.5 inches (69.9 cm), with 11.4 inches (28.9 cm) falling in summer. Average annual snowfall is 43.7 inches (110.9 cm). Elevation: Elevation ranges from 1200 to 1300 feet (392-425 m). Geology and Soils: The topography is rugged, with a number of tall granite cliffs. The soil is variable, ranging from shallow sandy loams to fairly deep glacial deposits of sand. Aquatic Features: Nearly ¼ of the site is covered by water. Boulder River transverses the site, and Lake Agnes and Boulder Bay border the site. Common Mammal Species: Moose (Alces alces), black bear (Ursus americanus), white-tailed deer (Odocoileus virginianus). Aakala, T. S. Fraver, B.J. Palik, and A.W. D’Amato. 2012. Spatially random mortality in old-growth red pine forests of northern Minnesota. Can J For Res 42: 899-907. Fraver, S. and B.J. Palik. 2012 Stand and cohort structures of old-growth Pinus resinosa-dominated forests of northern Minnesota, USA. Journal of Vegetation Science 23: 249-259. Heinselman, Miron. 1996. The Boundary Waters Wilderness Ecosystem. University of Minnesota Press, Minneapolis, MN. 334 p.